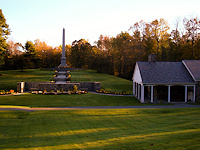 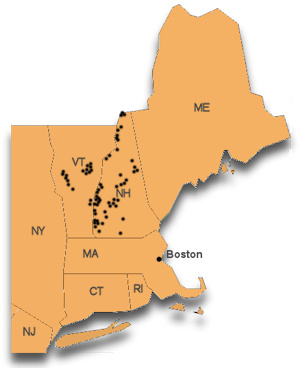 A few years had passed since our excursions to see the lighthouses of northern and southern New England. 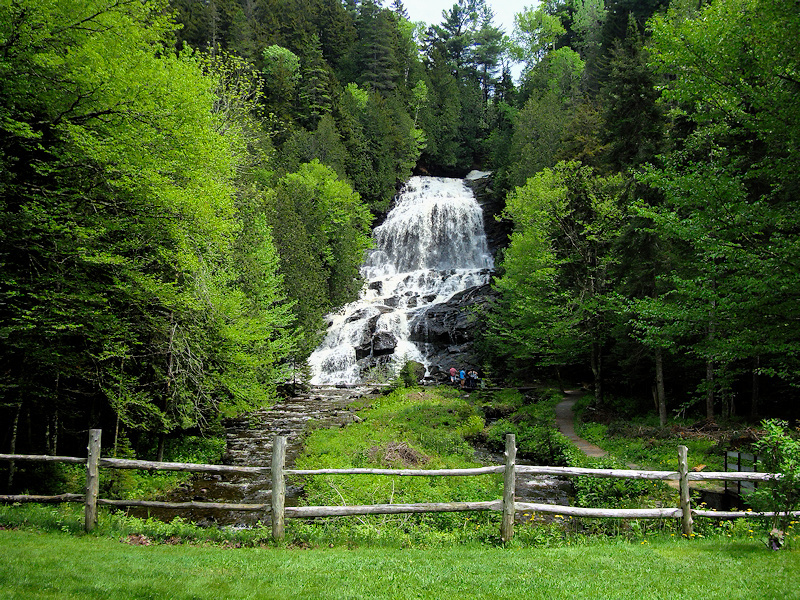 We had found it to be a particularly rewarding experience as it got us out of the house (and from underneath our laptops) to see some of this part of the country that we wouldn’t normally see. 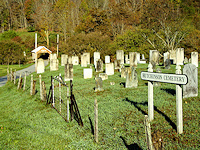 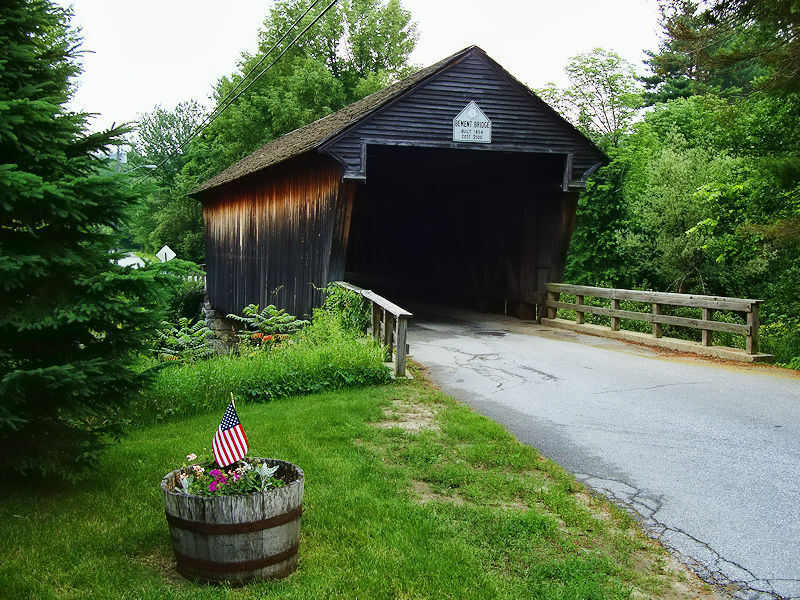 We were getting the feeling that our days in New England were numbered, and we wanted to create a similar photo essay that would help us get to know the interior of New England. 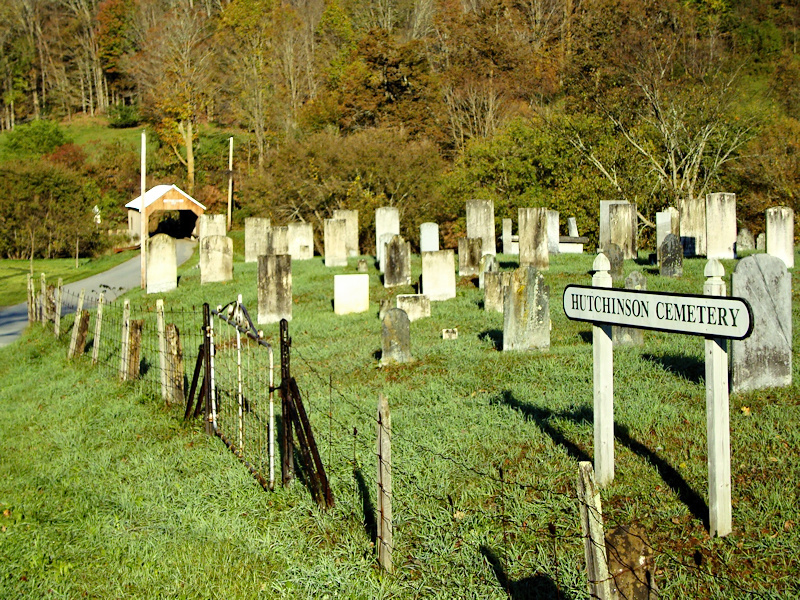 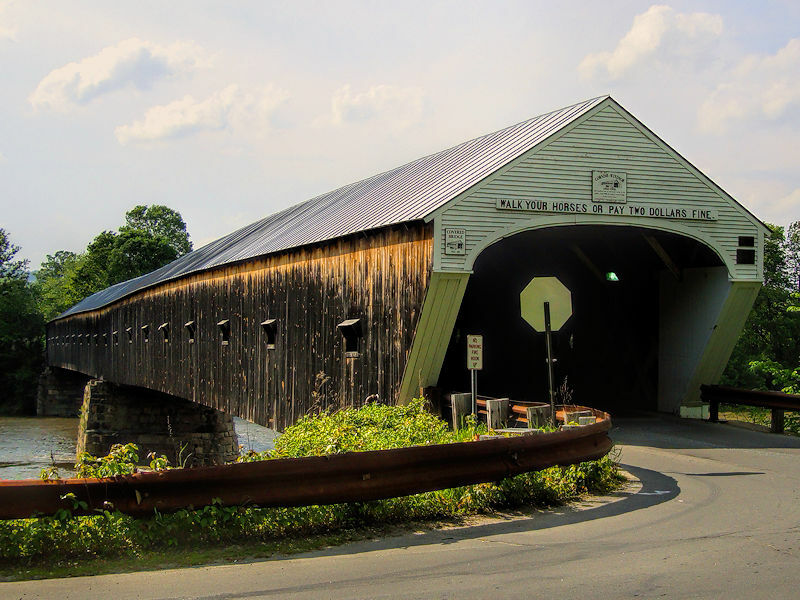 We thought about some potential subjects such as the beautiful old churches that could be found in almost any small town, the quaint drystone walls that crisscrossed the countryside, and even the iconic brick mill buildings that were so much a part of this region’s history. 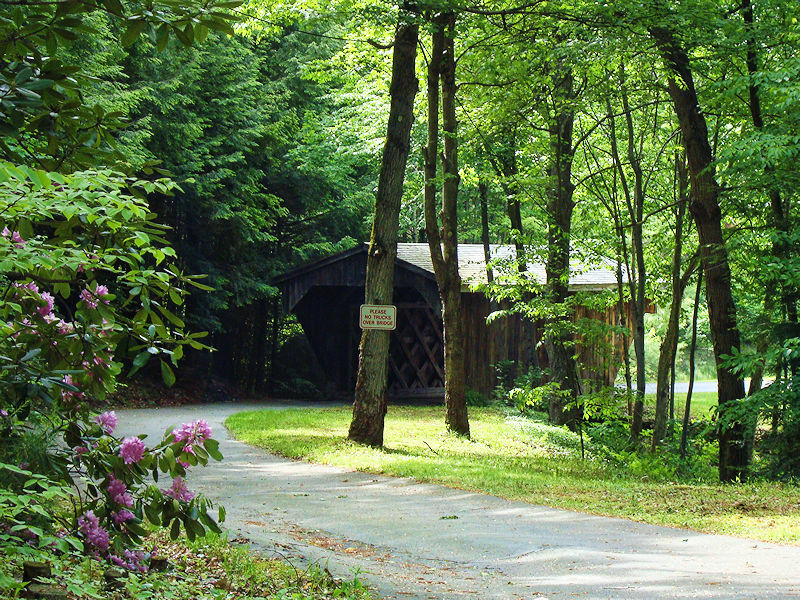 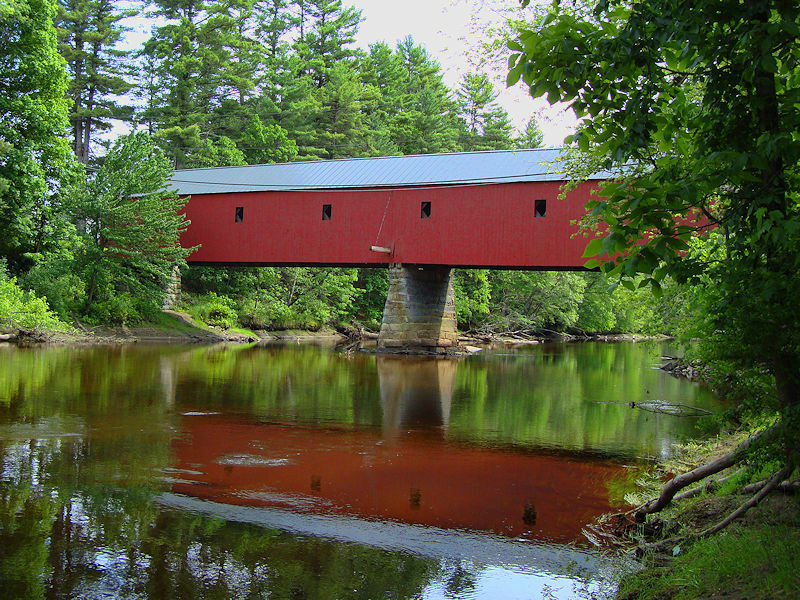 But in the end, we went with the obvious choice – covered bridges. 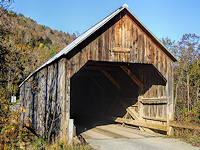 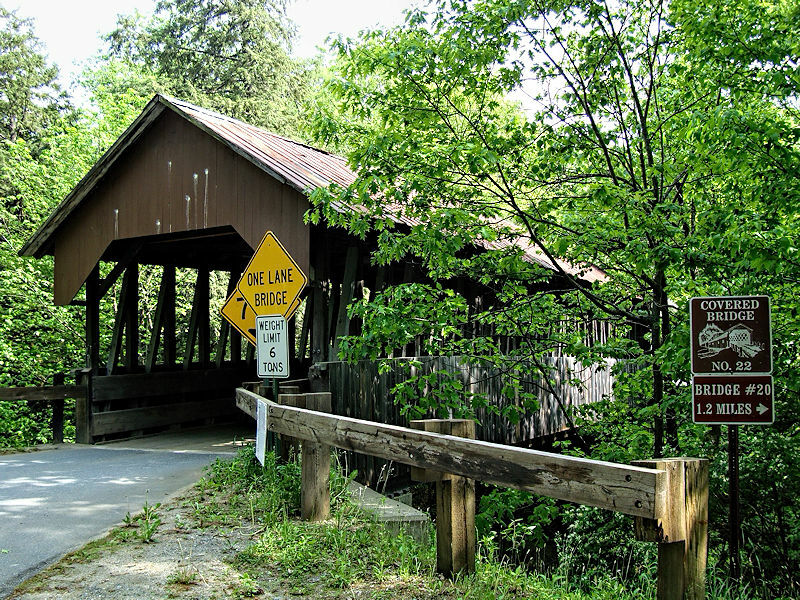 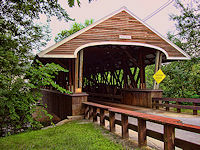 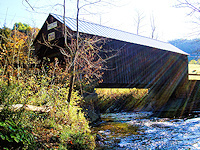 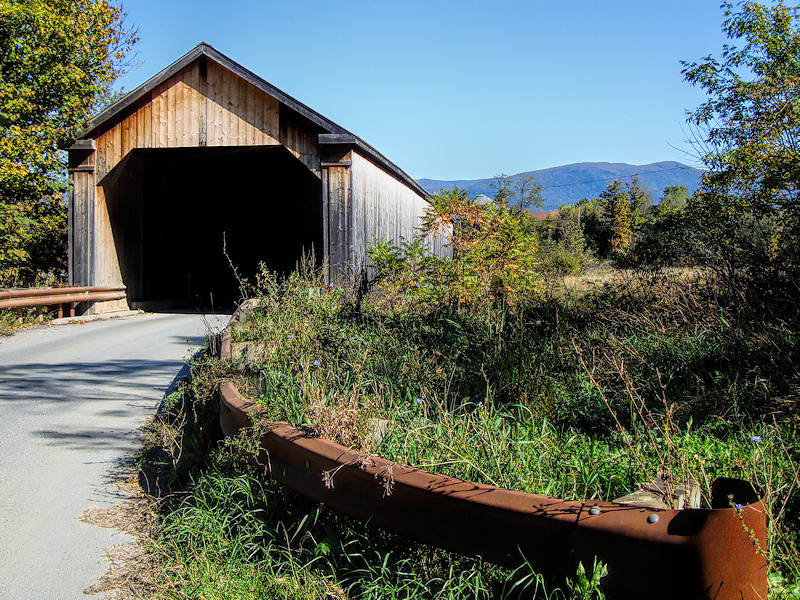 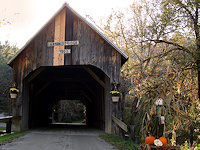 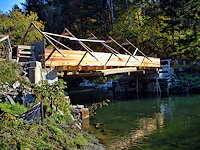 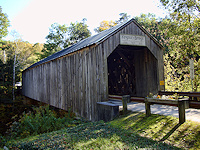 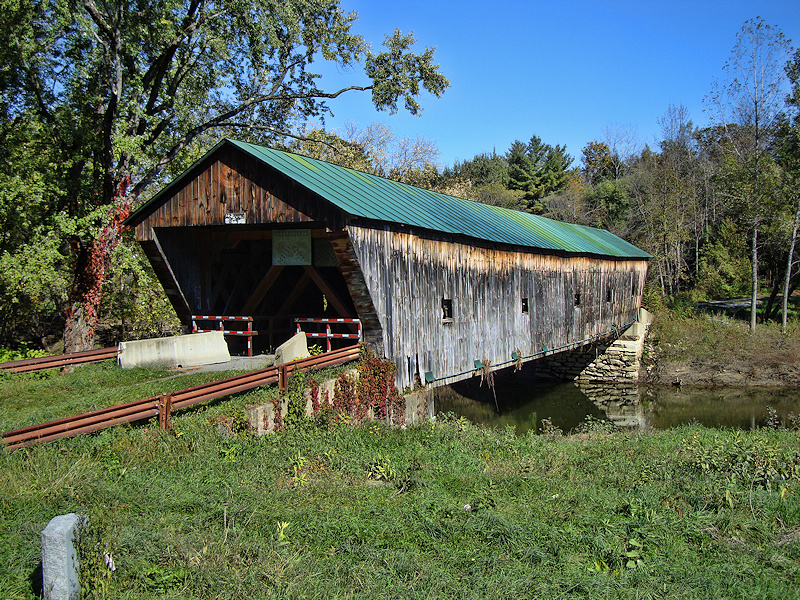 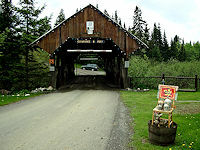 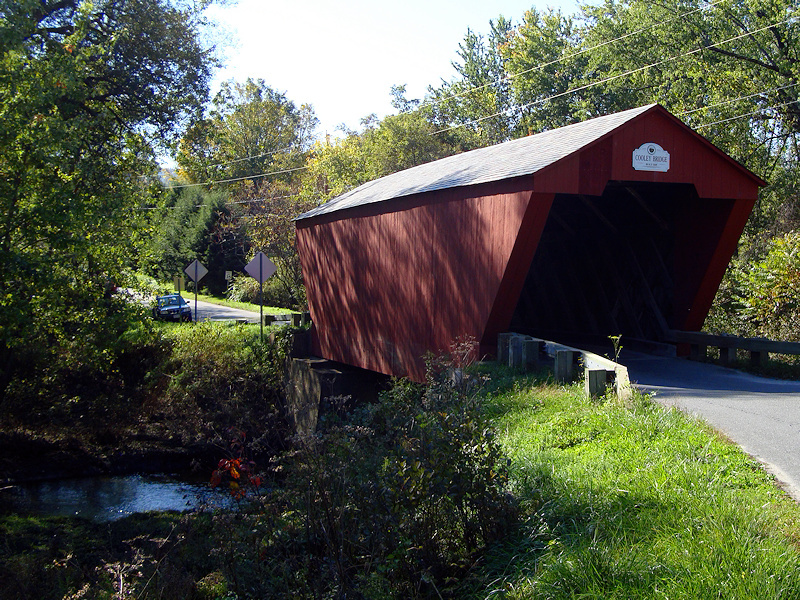 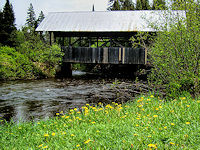 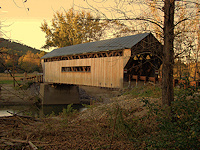 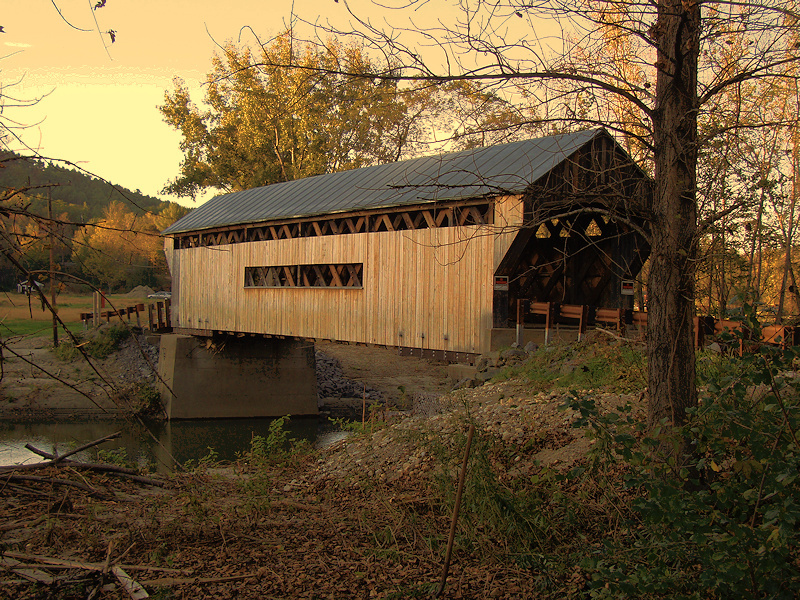 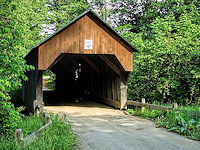 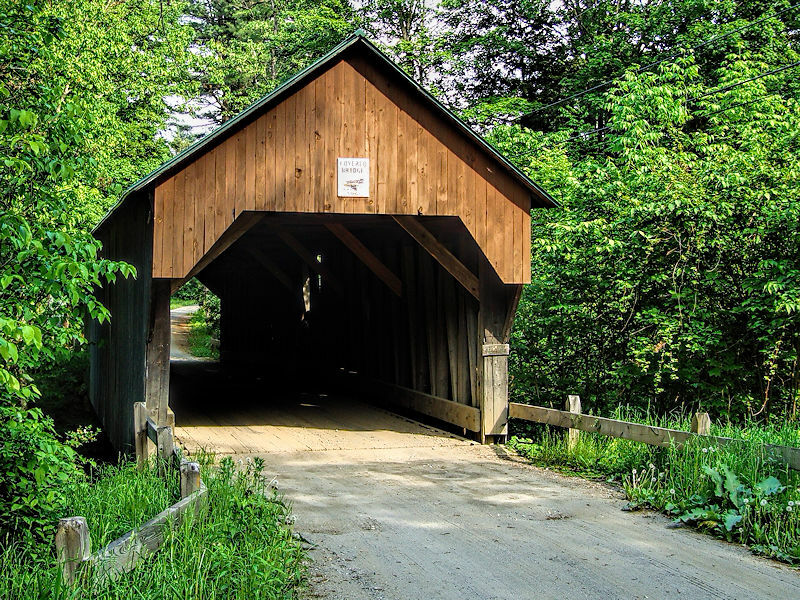 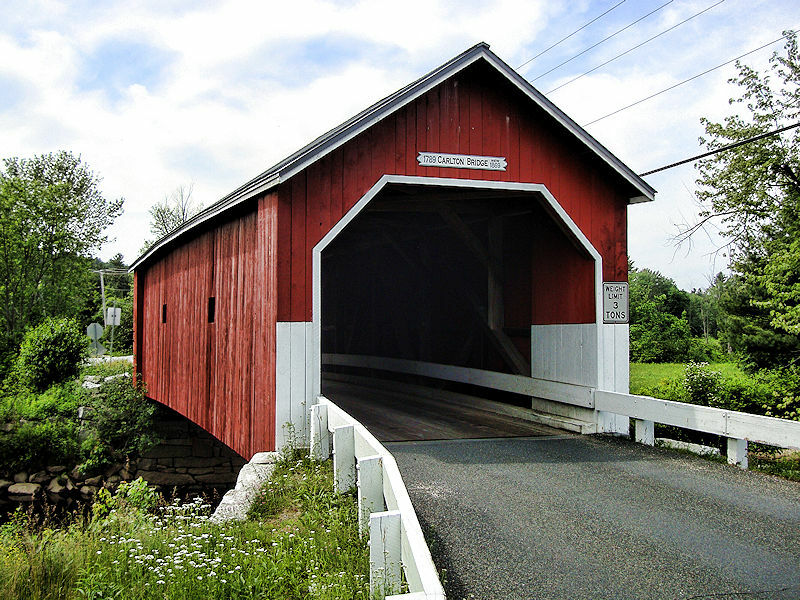 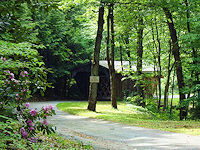 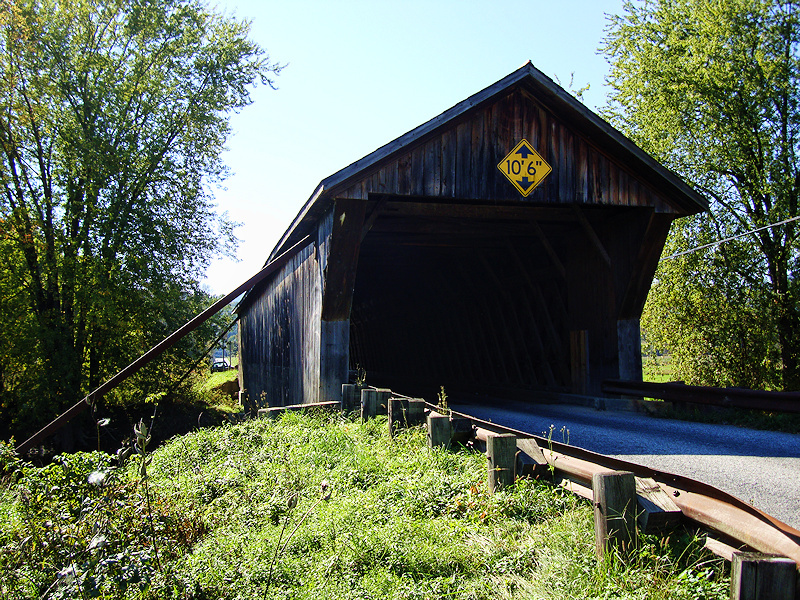 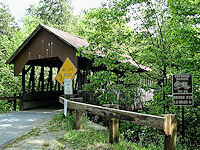 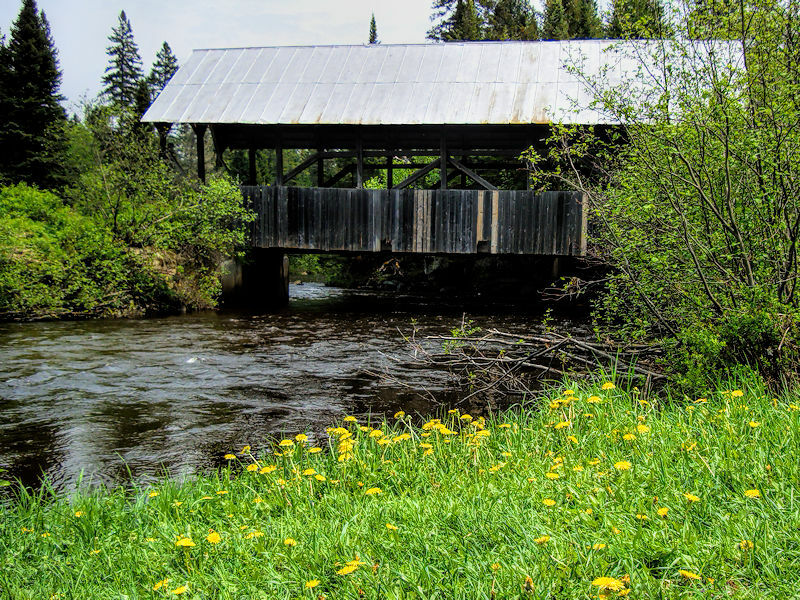 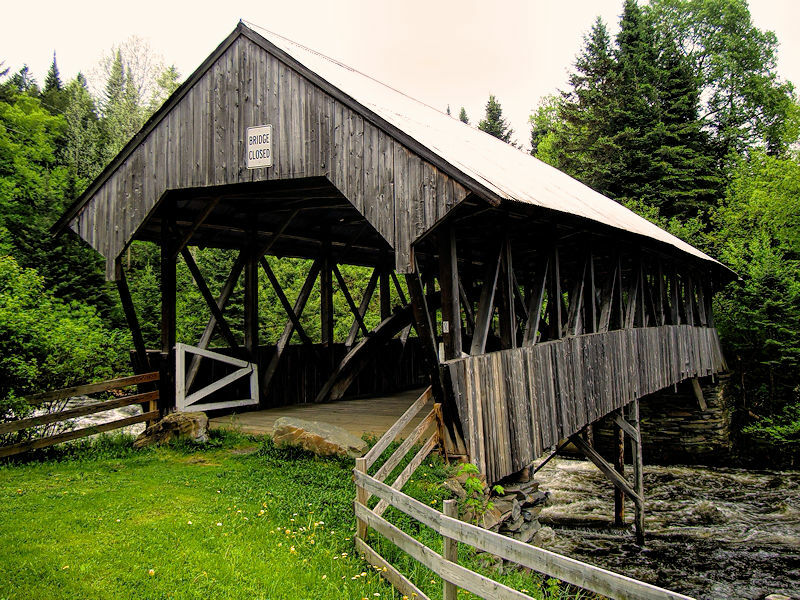 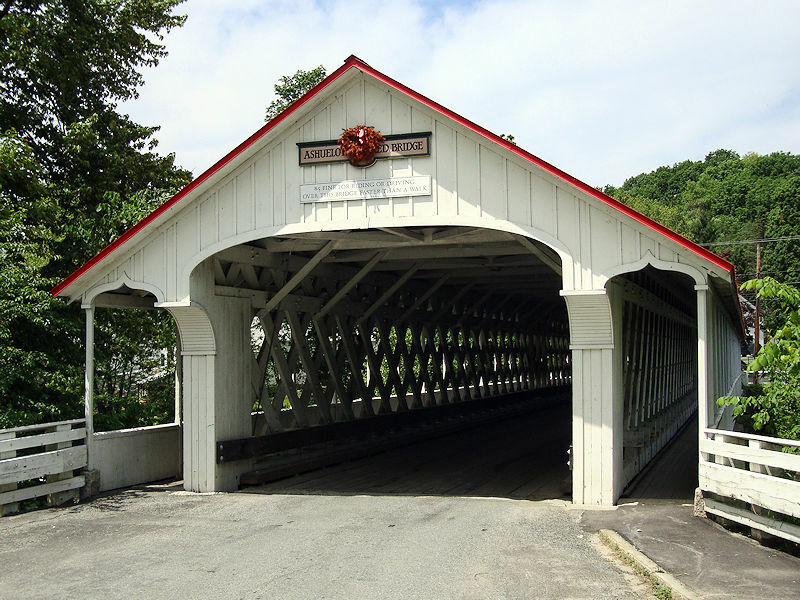 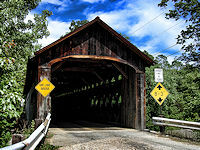 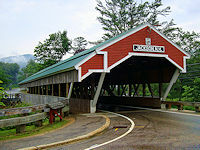 It is generally accepted that covered bridges exist because protecting the framework from the elements by adding a roof could greatly extend the life of the bridge. 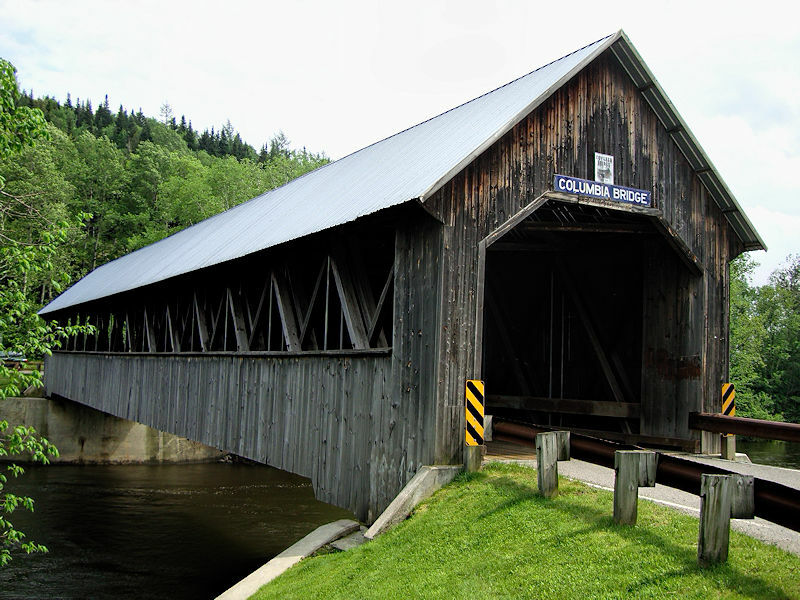 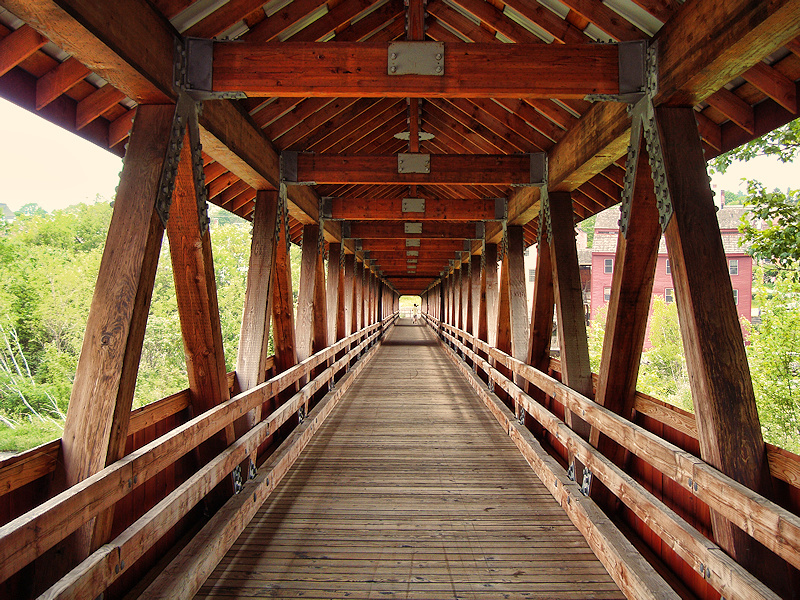 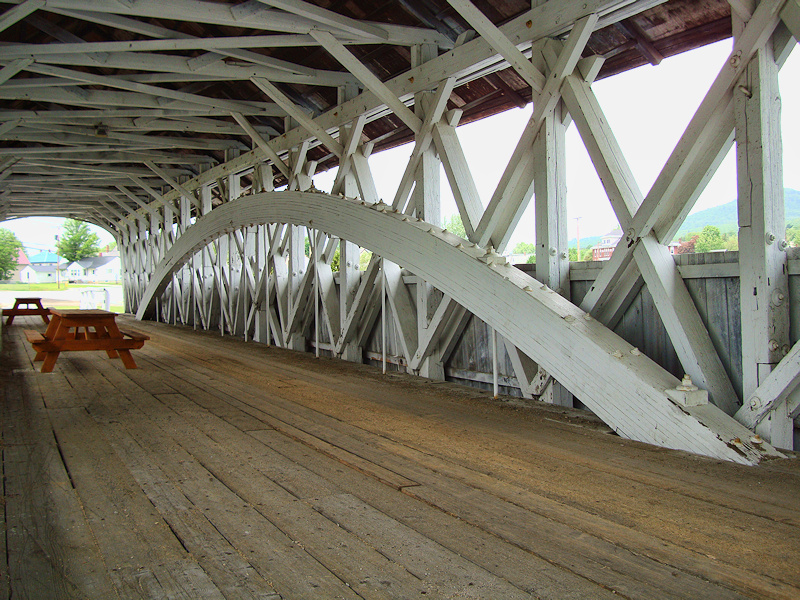 Initially, the Kingpost and Queenpost truss systems used were based on European designs which extended bridges to 100 feet. However, the need to span greater distances resulted in the development of new American designs such as the Burr Arch and Town Lattice trusses which doubled the length of bridge spans between supports. 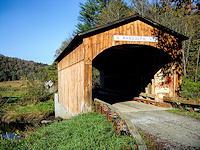 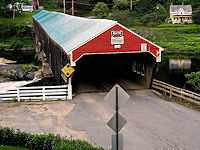 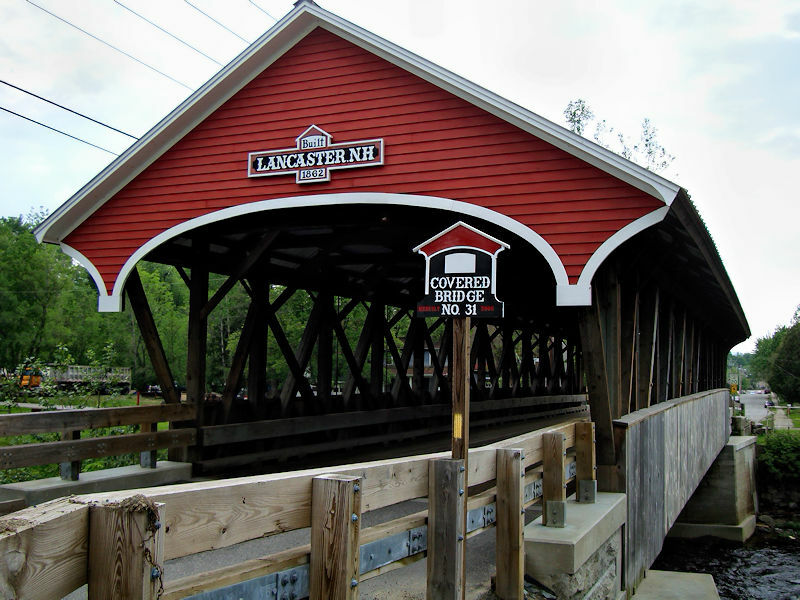 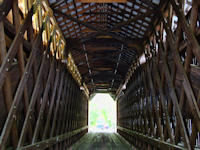 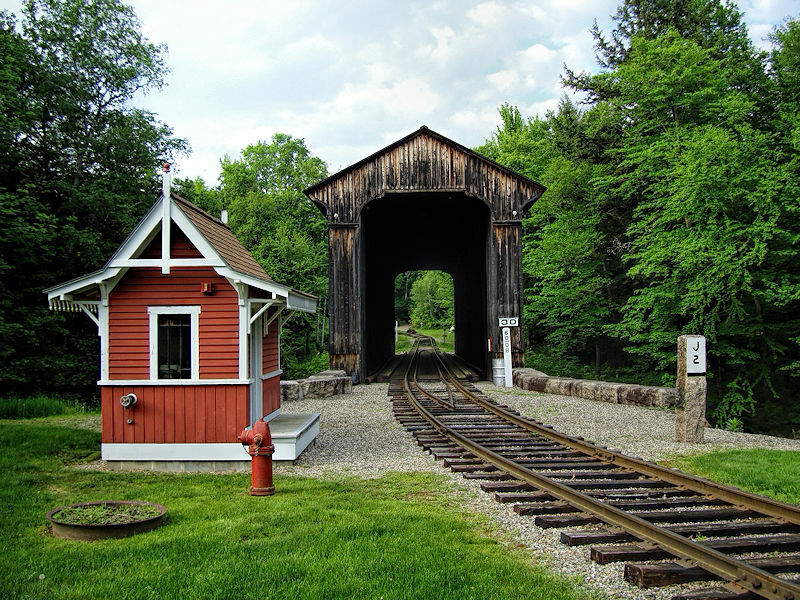 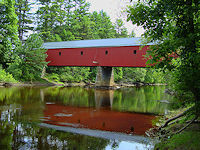 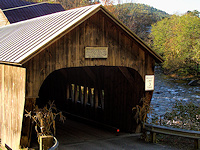 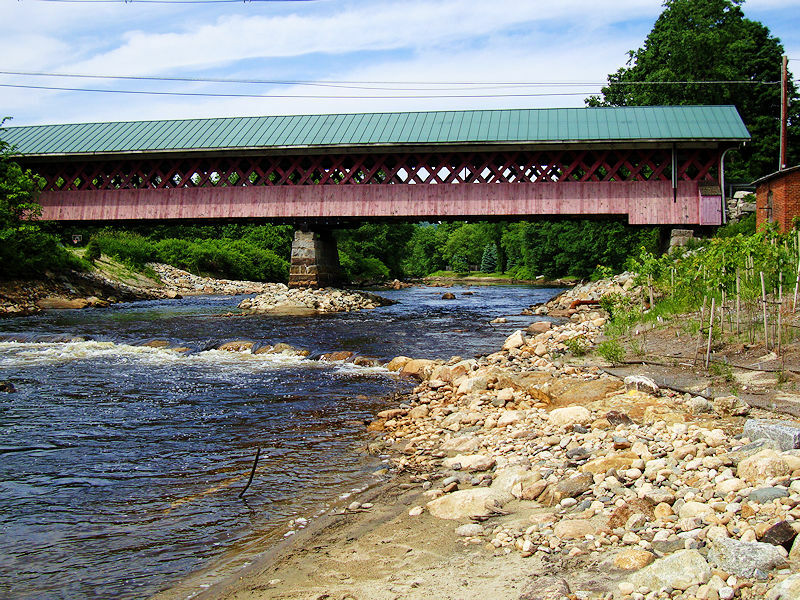 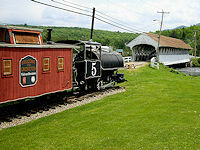 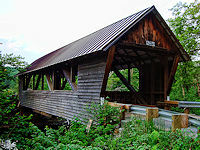 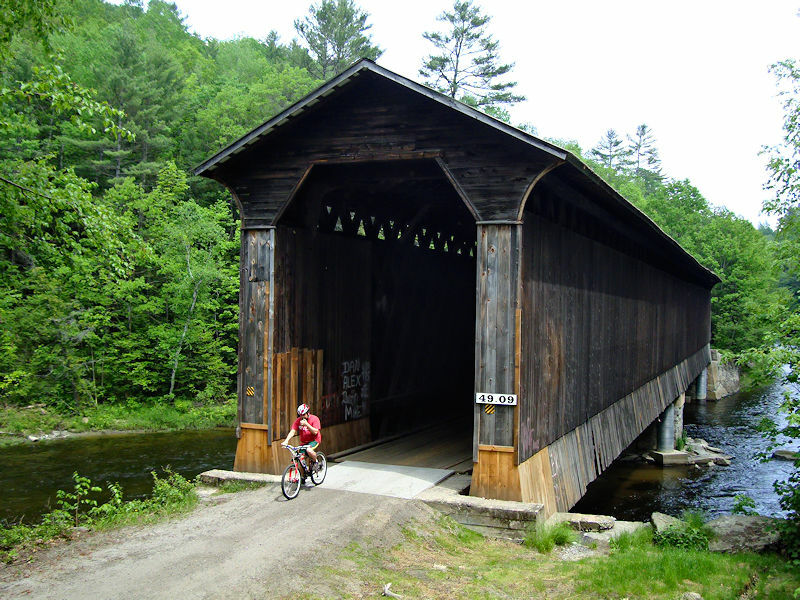 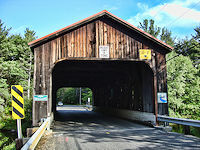 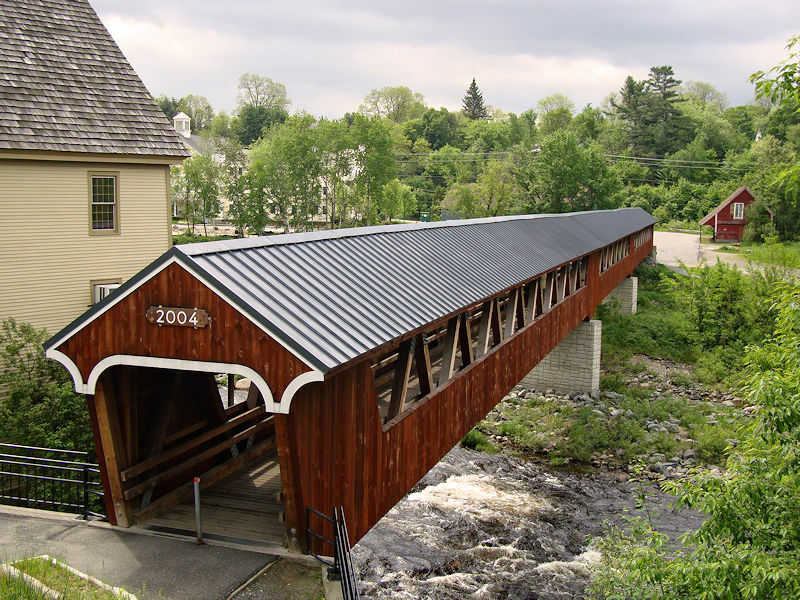 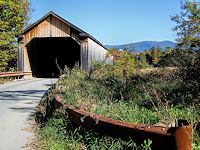 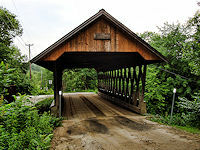 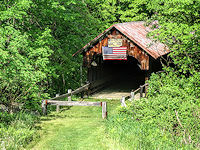 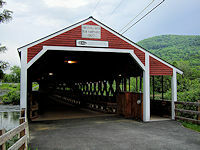 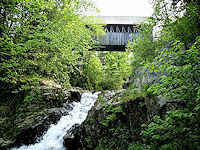 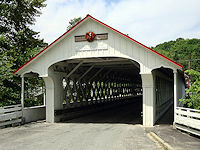 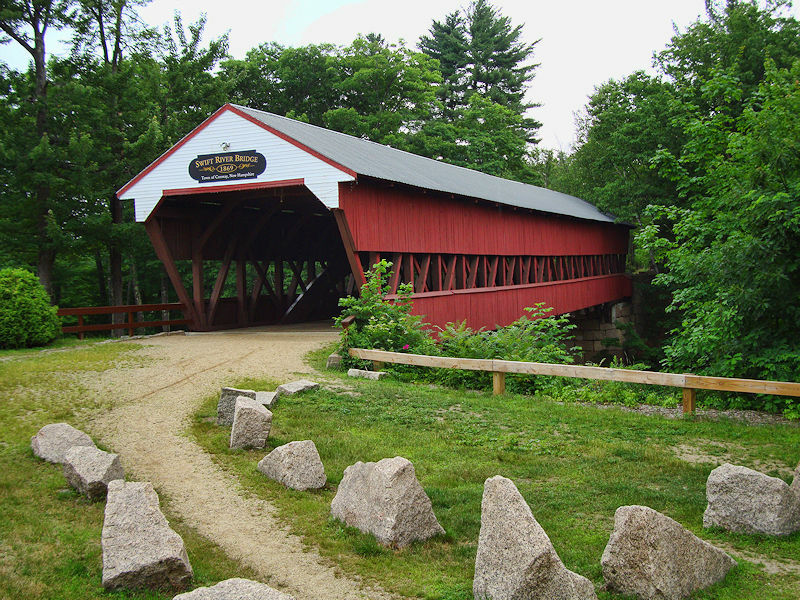 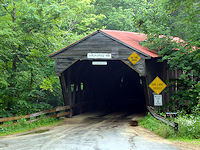 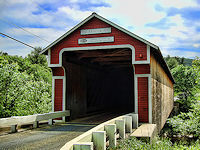 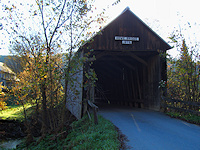 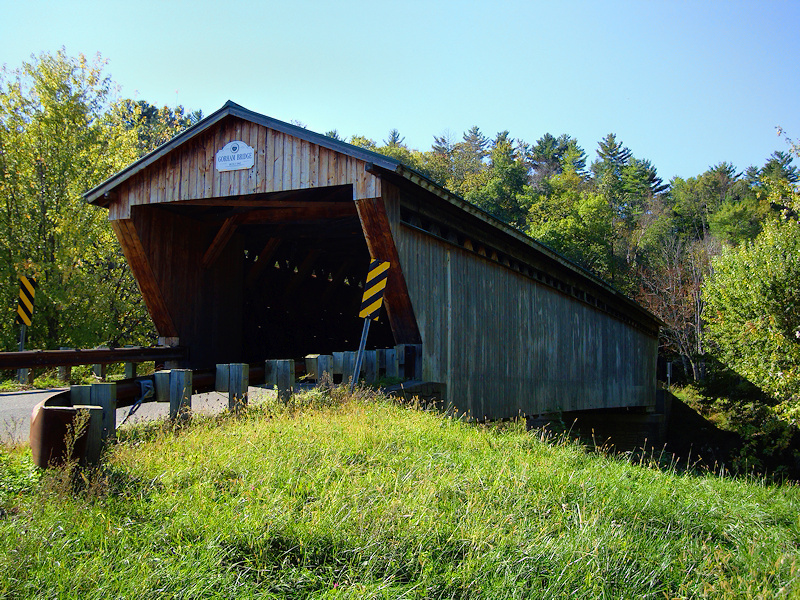 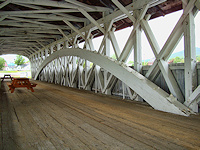 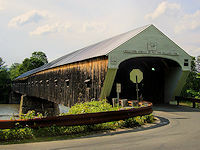 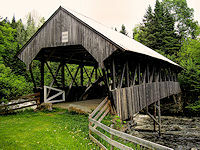 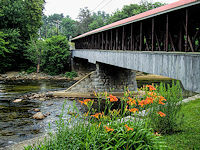 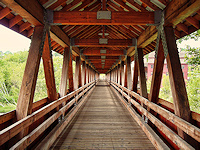 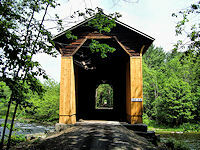 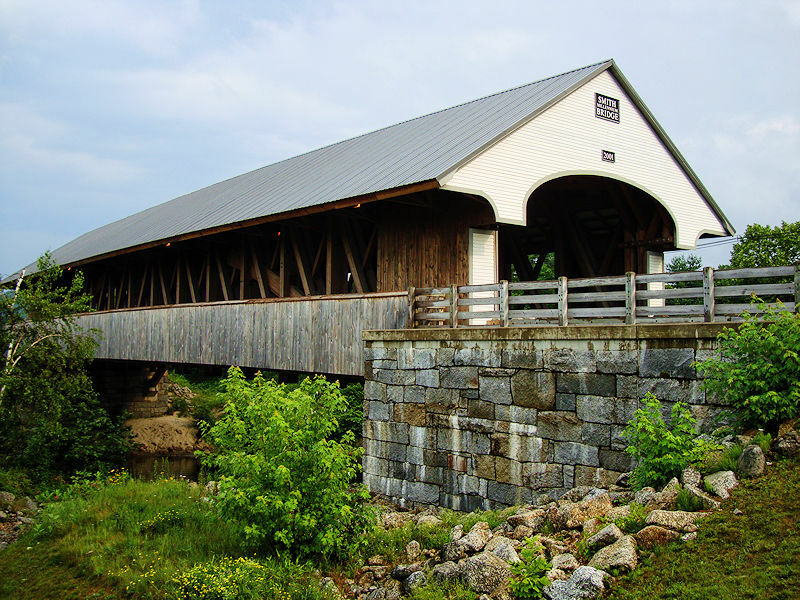 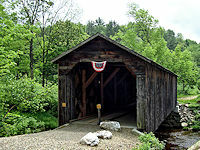 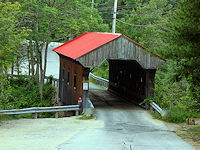 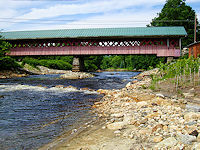 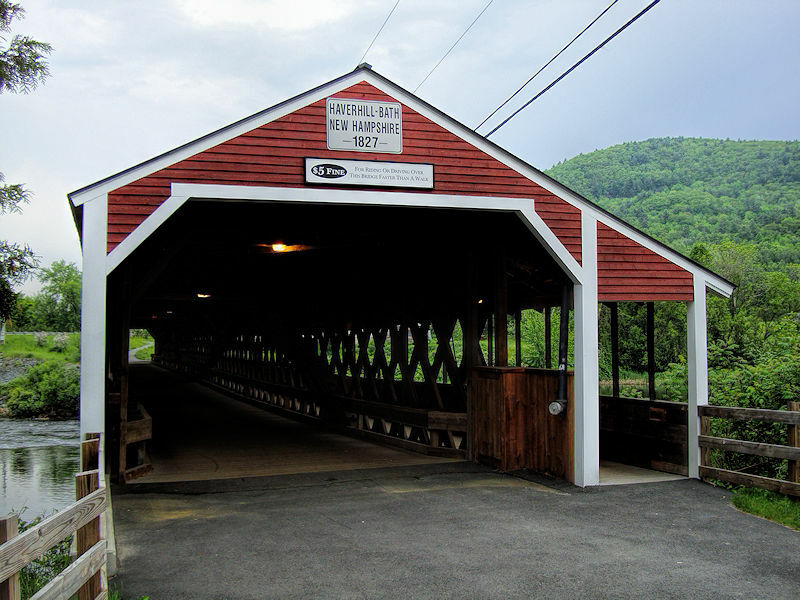 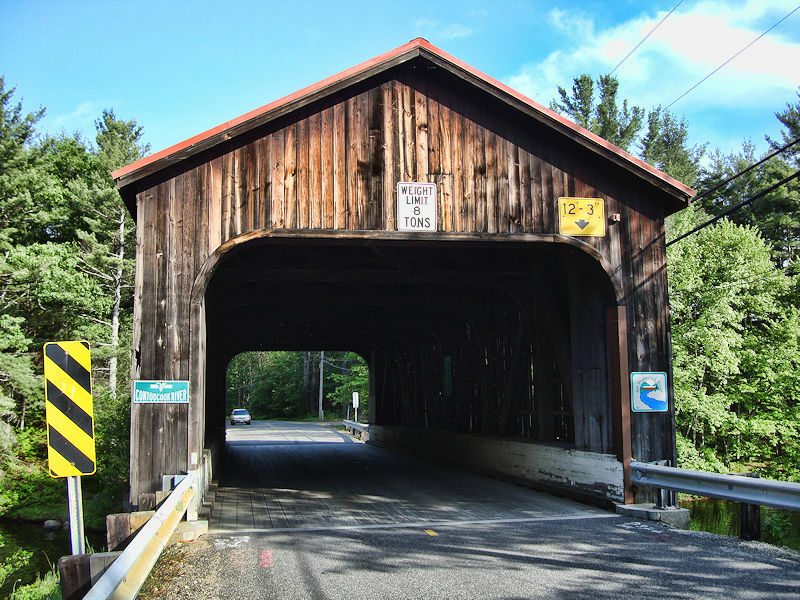 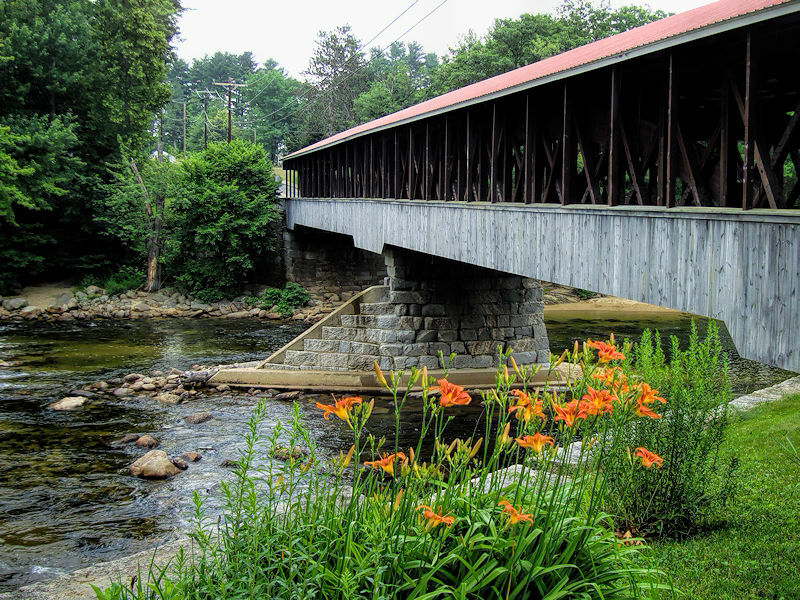 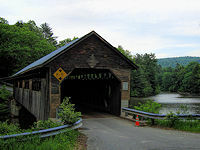 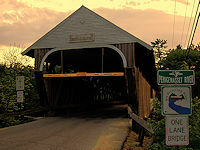 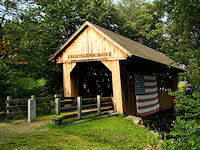 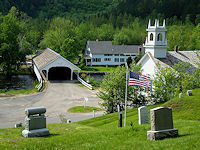 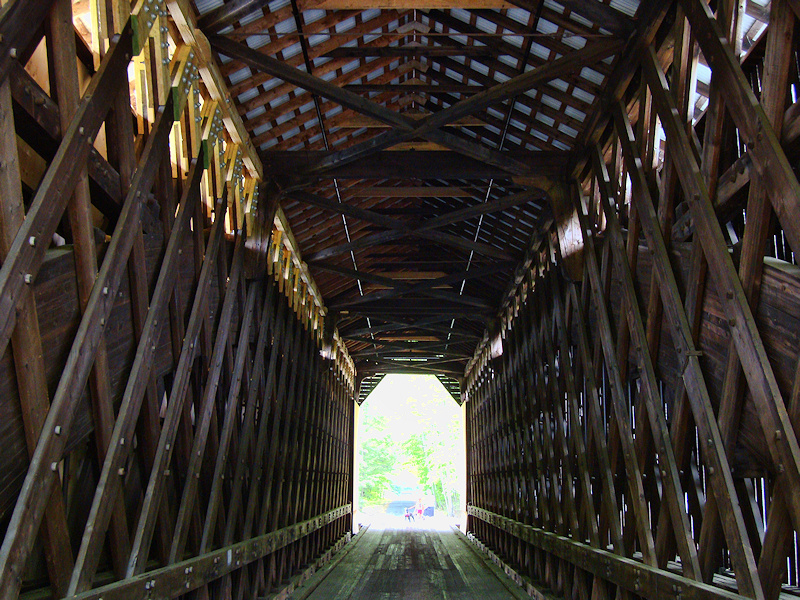 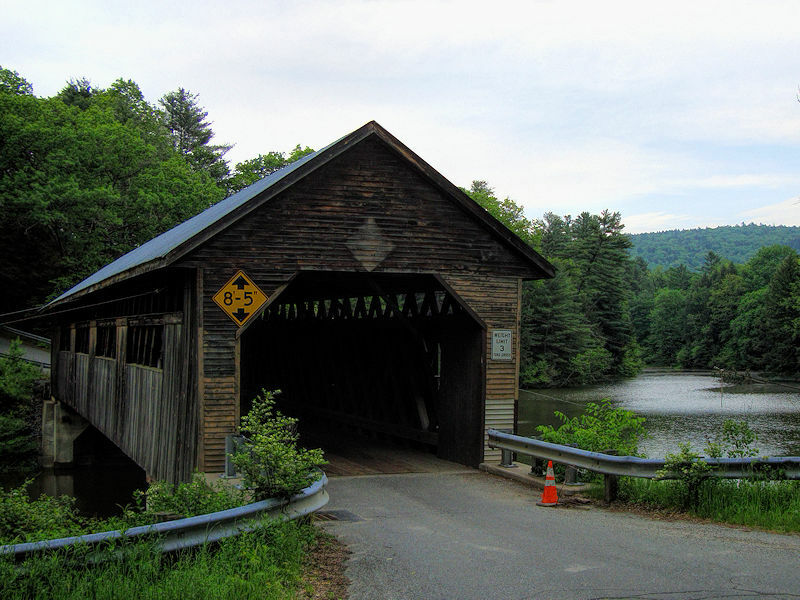 The longest covered bridge in the country, the 450 foot Cornish-Windsor, was built using the Town Lattice design in 1866 and appropriately links New Hampshire with Vermont across the Connecticut River. 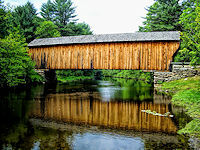 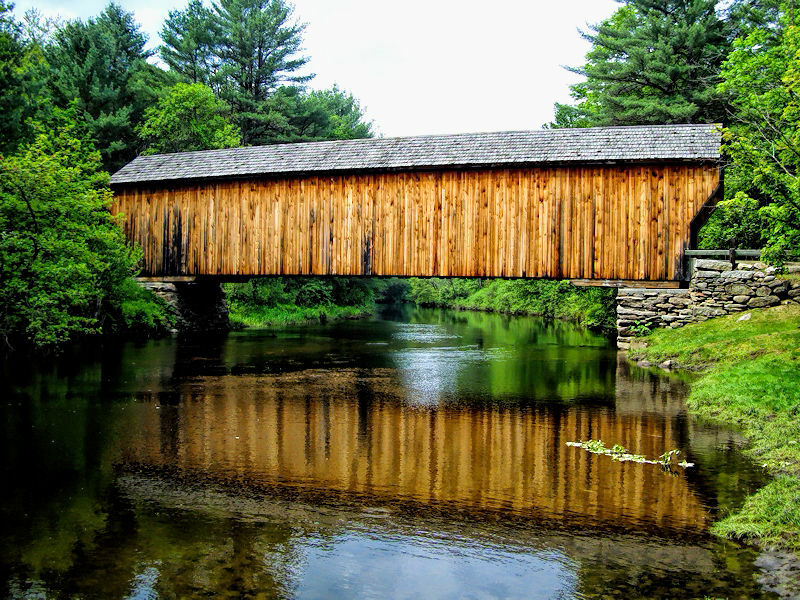 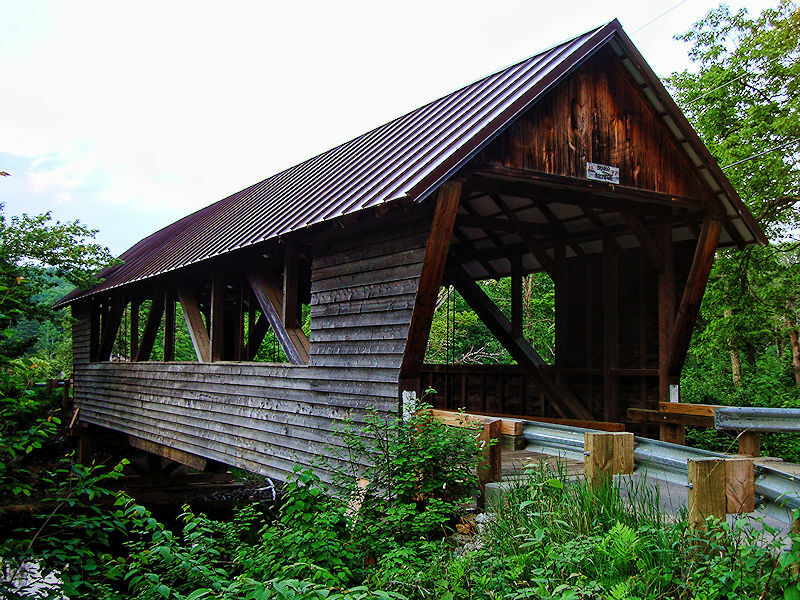 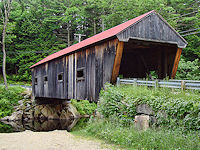 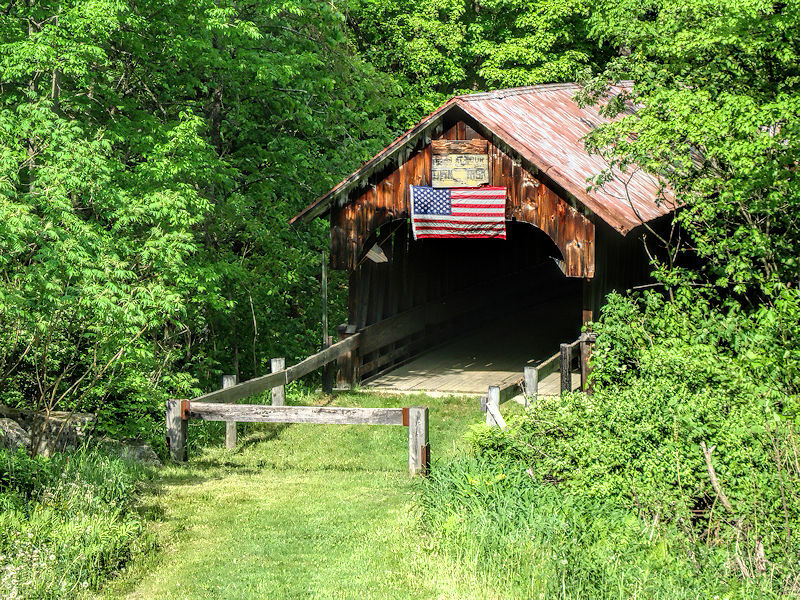 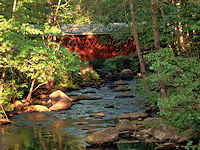 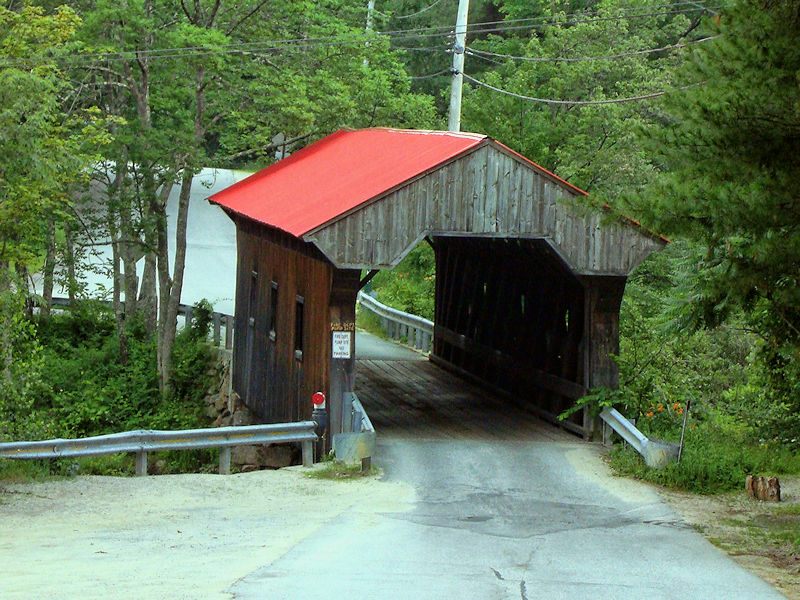 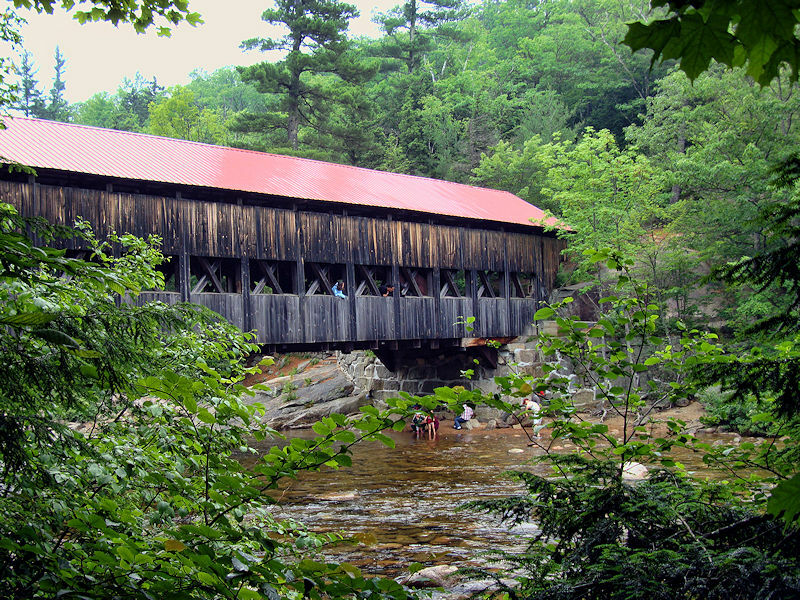 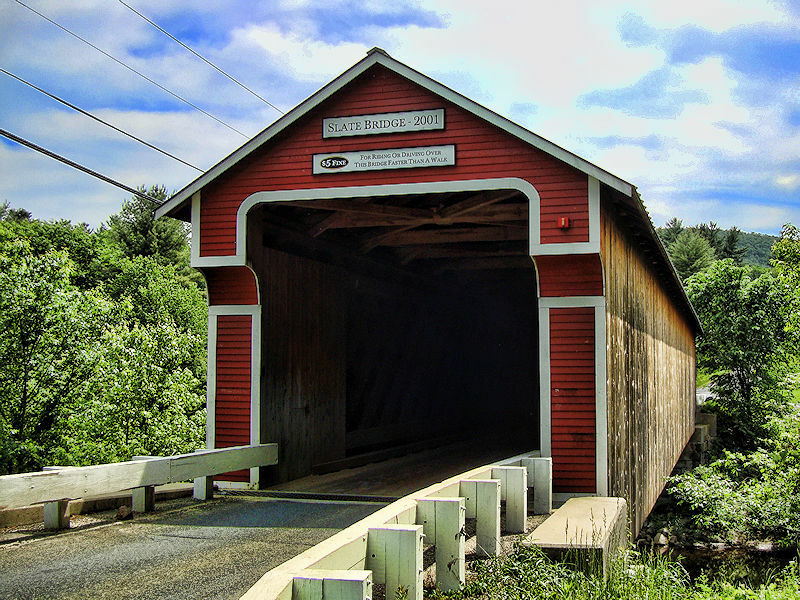 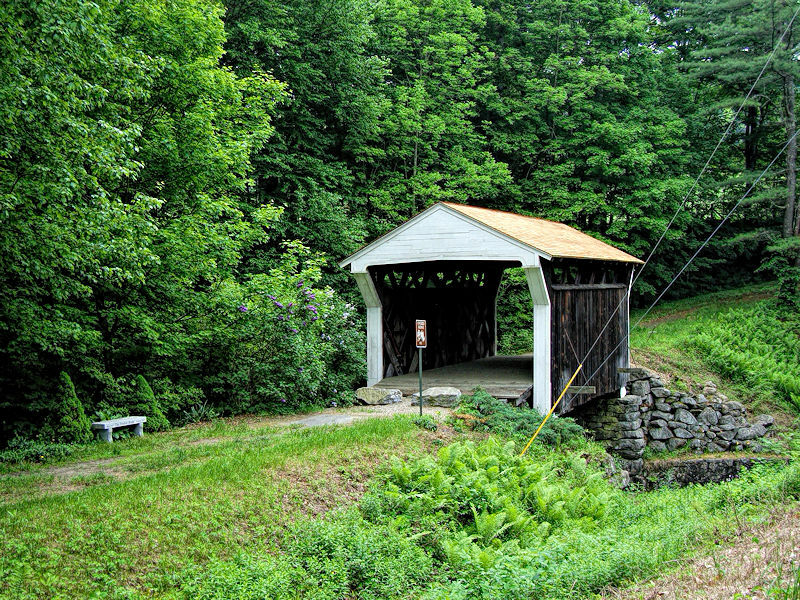 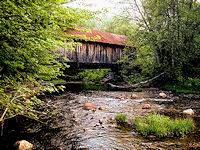 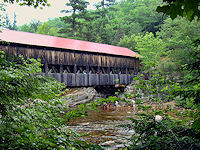 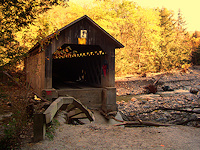 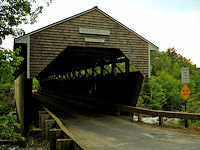 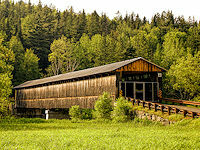 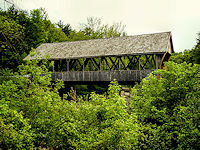 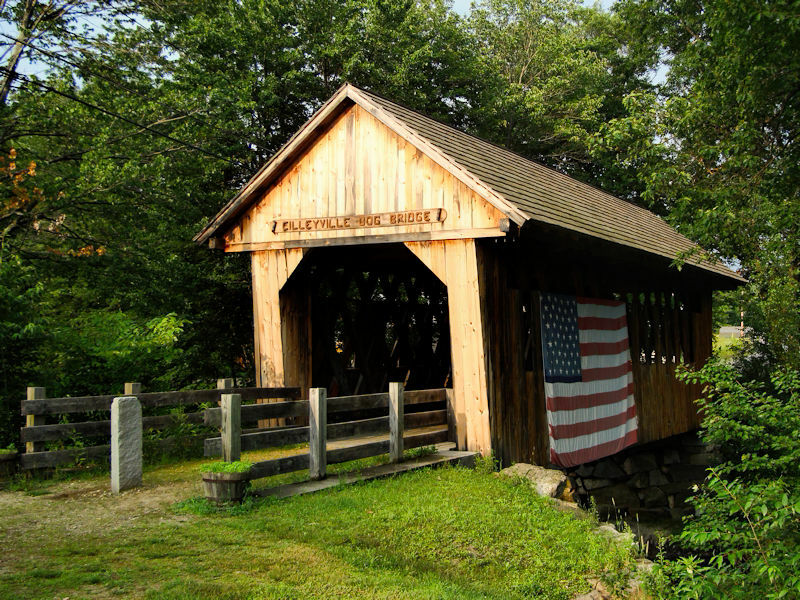 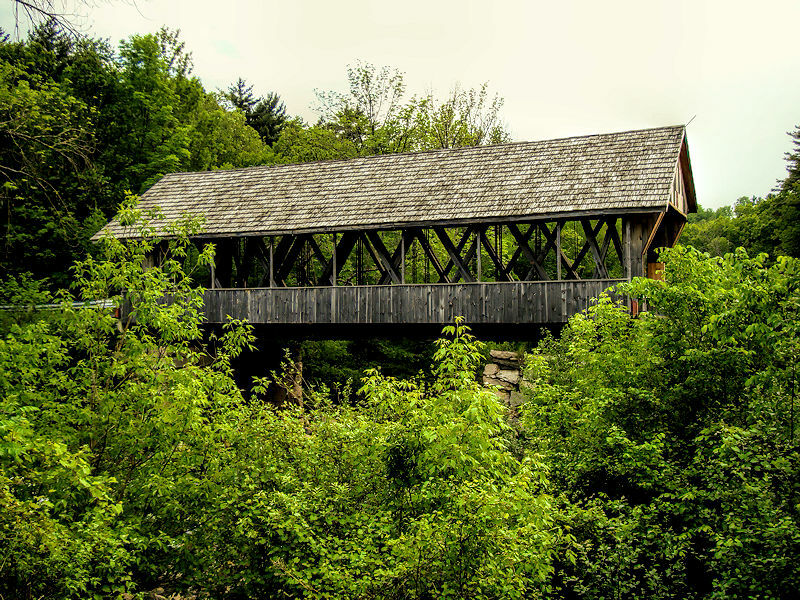 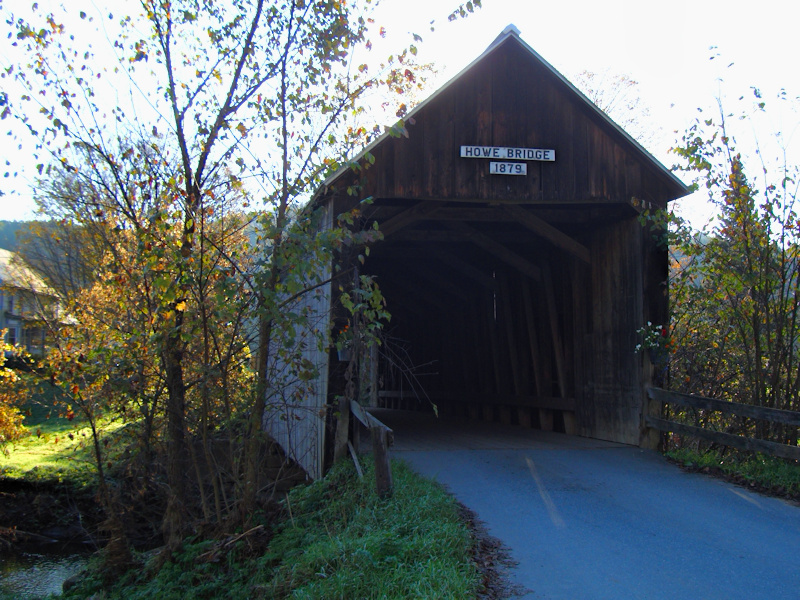 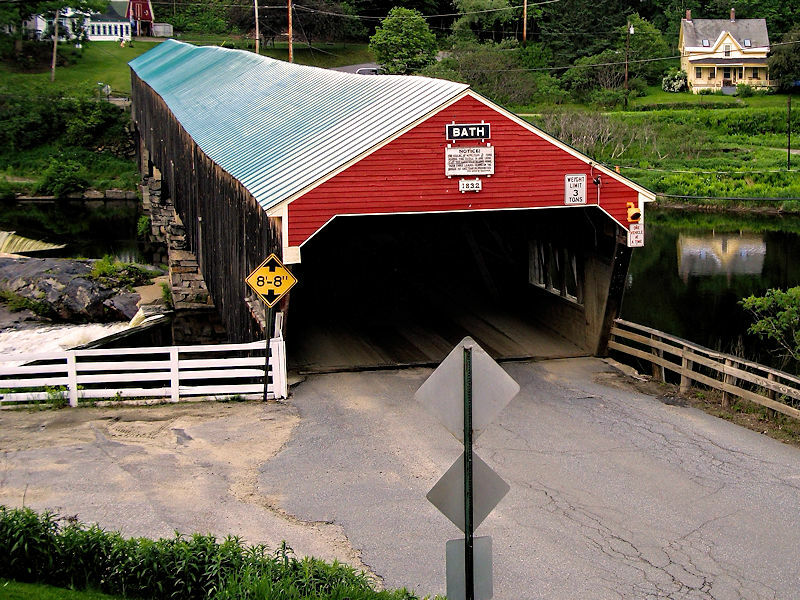 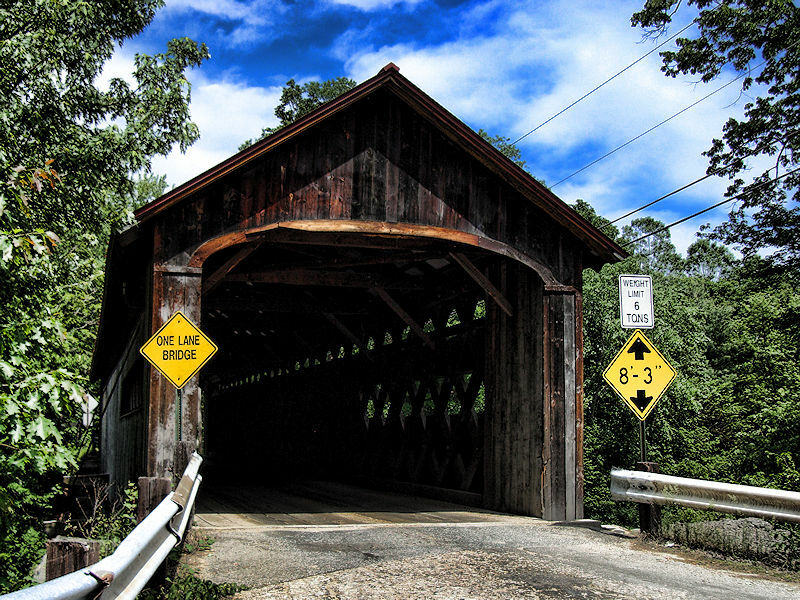 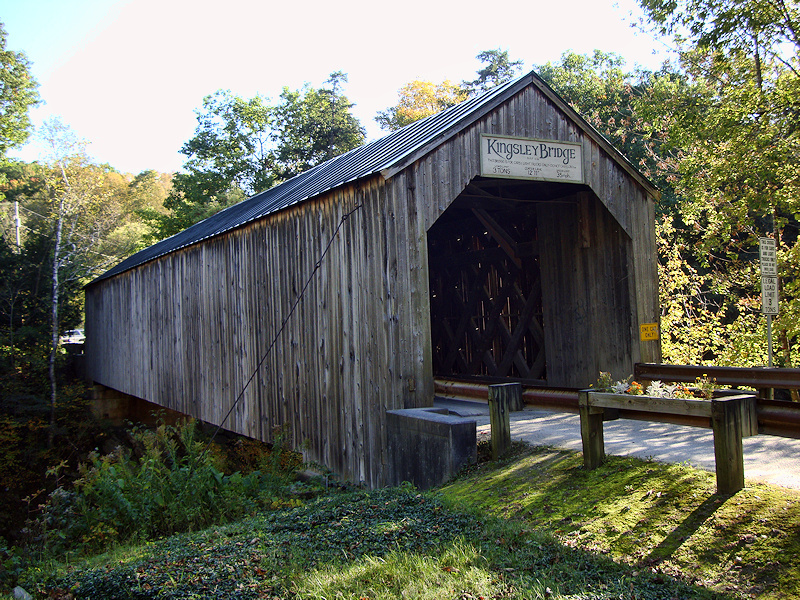 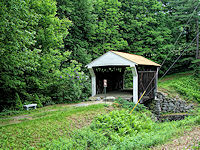 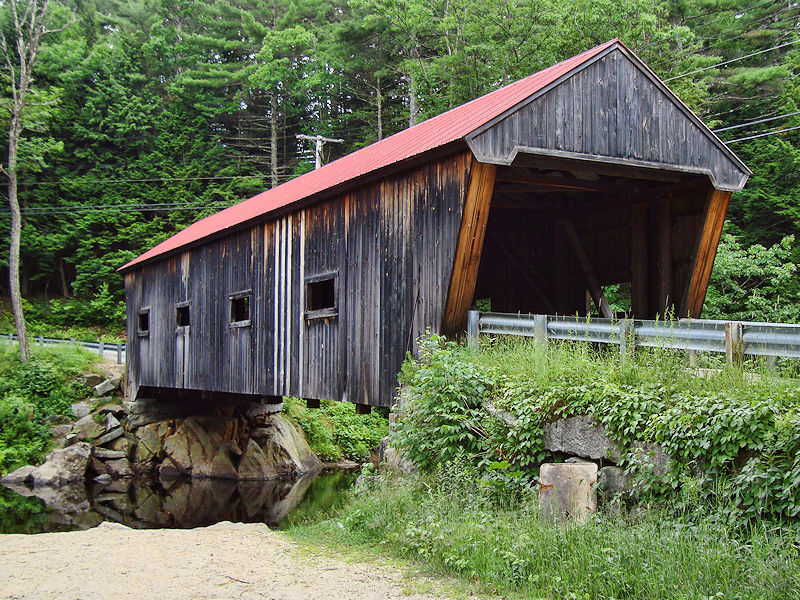 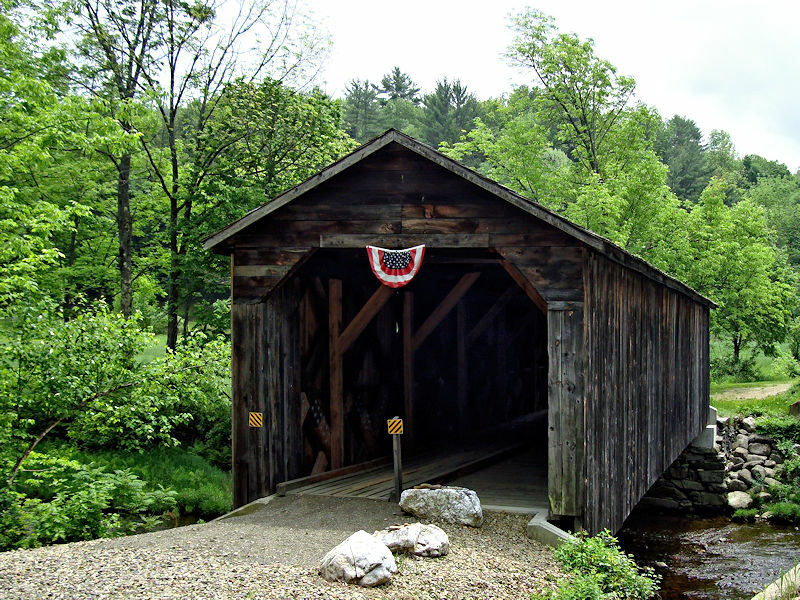 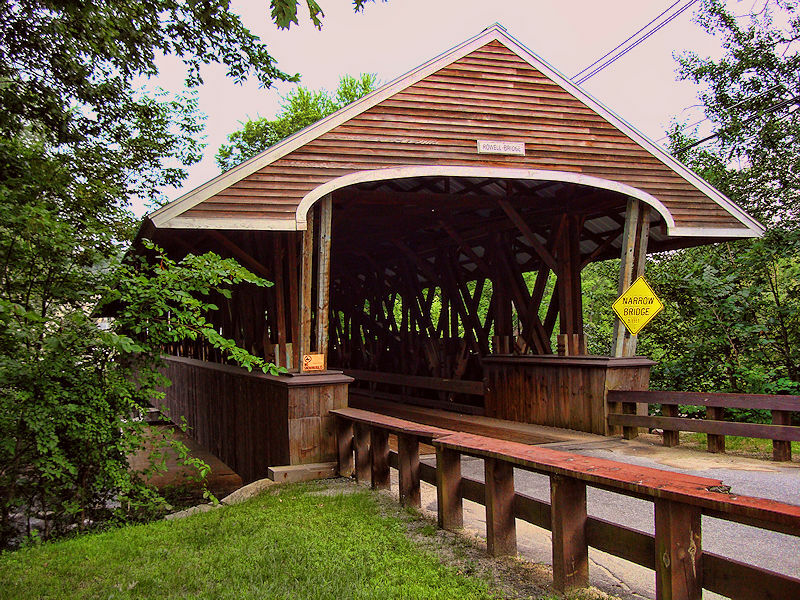 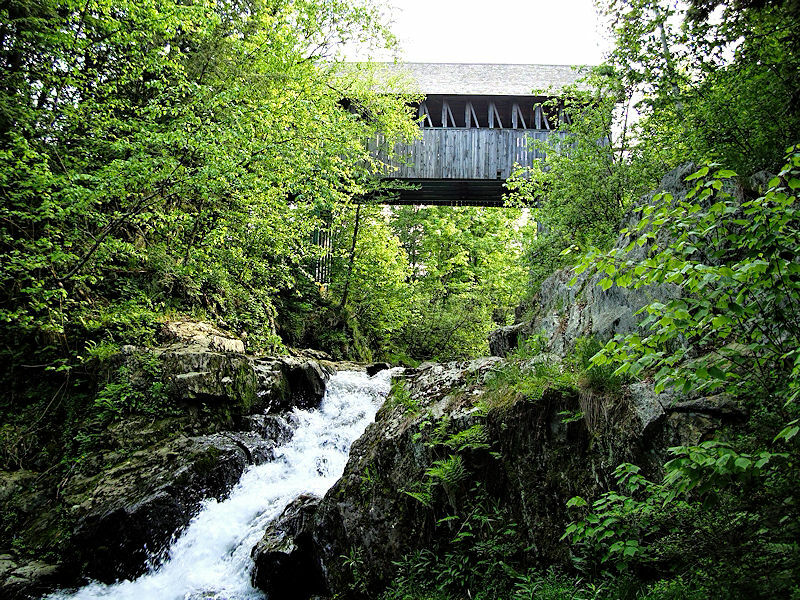 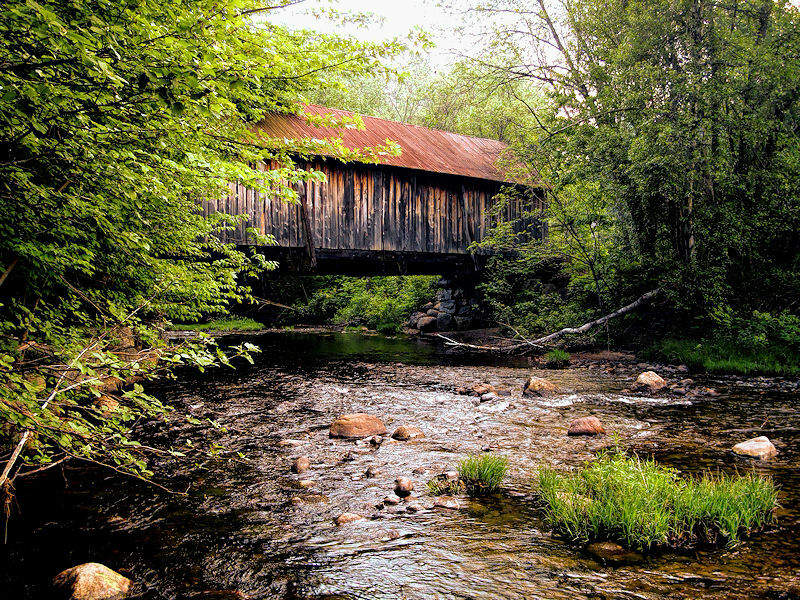 New England was once home to more than 1,000 covered bridges, but fewer than 200 have survived. 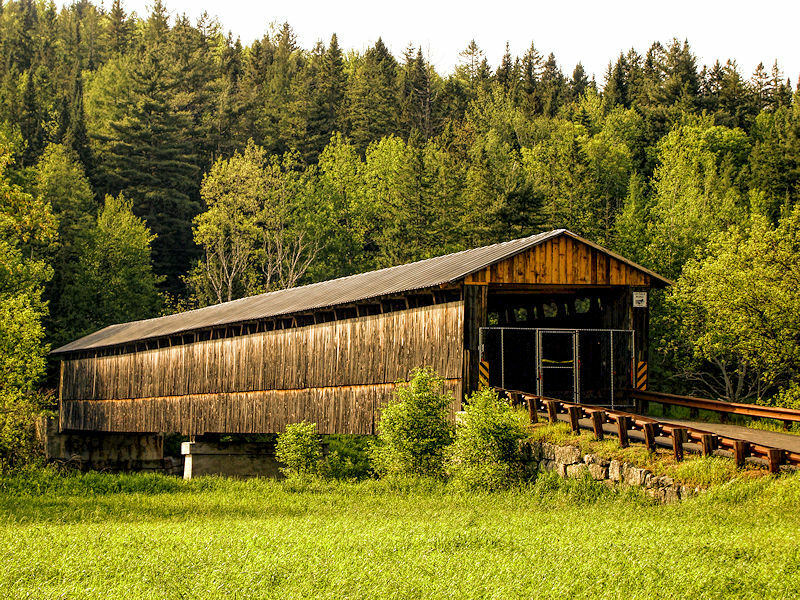 Three quarters of those are in Vermont and New Hampshire. 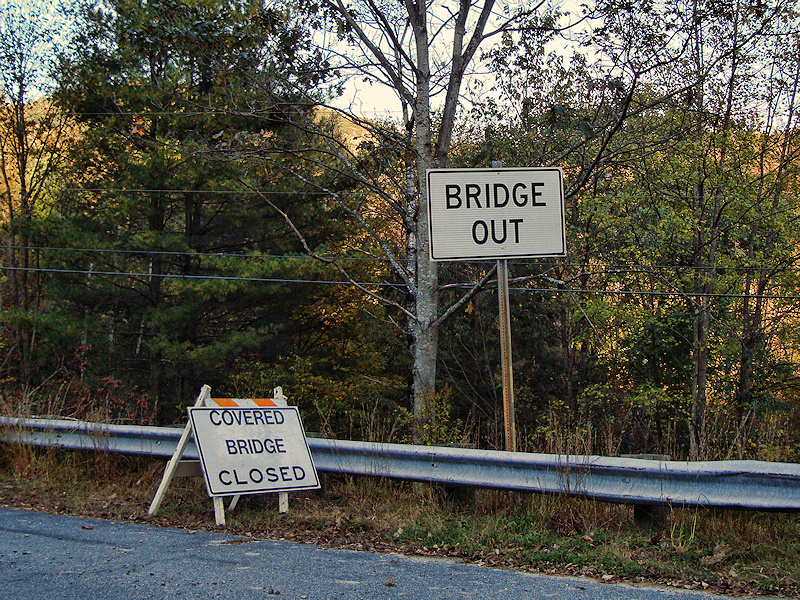 Sadly, even in the time we were on our quest to see some of these bridges, the number declined again. 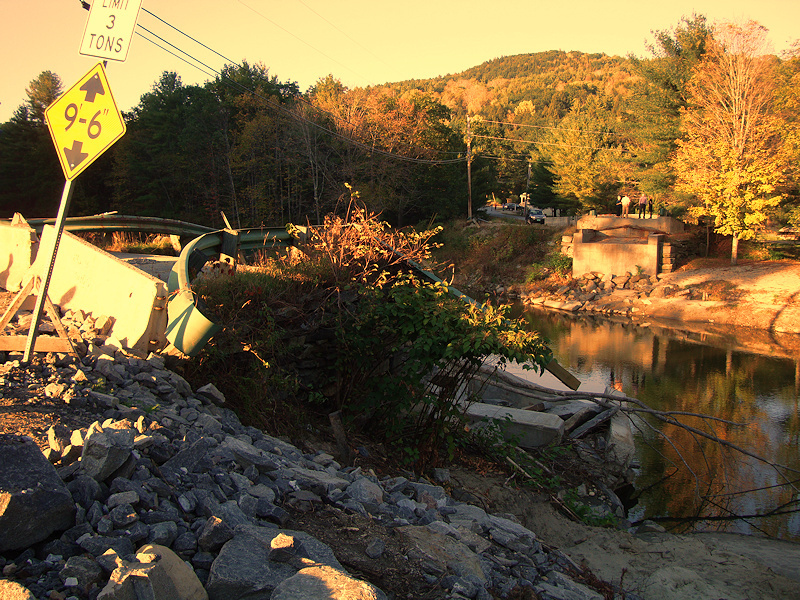 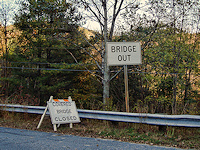 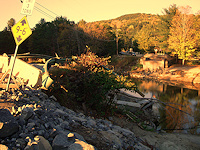 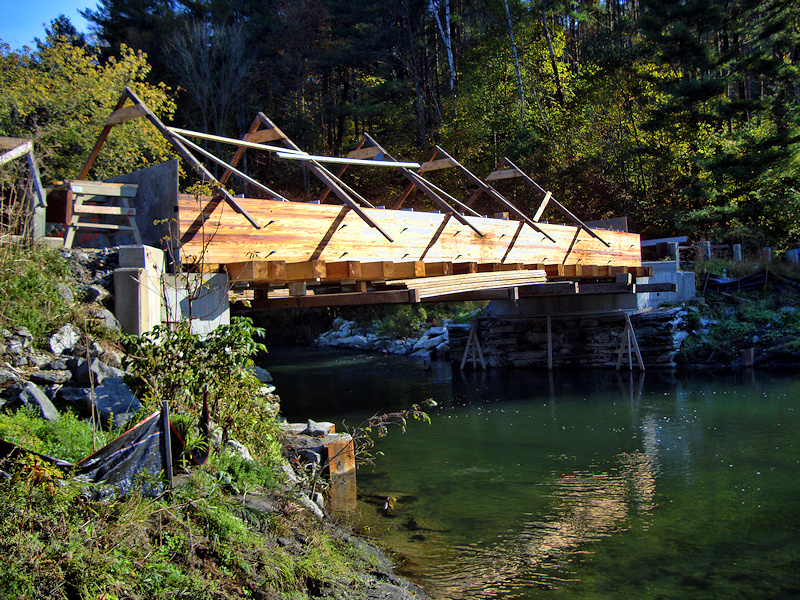 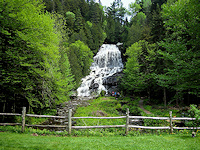 In the intervening summer between our visits to New Hampshire and Vermont, Hurricane Irene devastated the area and washed away several historic bridges such as the one in Bartonville with the subsequent flooding.